Unschooling Paradise | What is Unschooling? 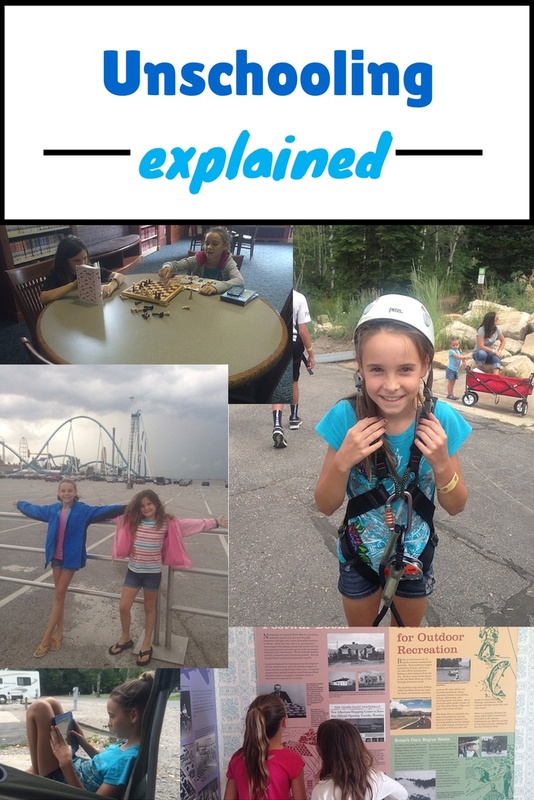 Unschooling is not really hard to explain…. First Unschooling is when kids decide what they want to learn, how they want to learn it and I as a parent I direct them to find the answers they seek. This has nothing to do with discipline, or letting your kids run wild and act like crazy people. This is an approach that lets the kids be in-charge of they’re learning process. Kids are small adults who all have different interest, different desires, some test badly, some can’t sit still, some kids read great, some read very badly. Kids are not all the same and this process allows a child to learn at their own pass, ask questions, do research and find out about the world around them. I do not use a traditional lesson plans, a particular curriculum, take test, do a lot of workbook sheet or big projects. Now with that in mind everyone is different, and some do incorporate different teaching methods into their school day. These are a list of several things we incorporate into our everyday lives and that we use currently or have tried in the past. Khan academy – Math – follow math at your own pace – start with 1+1 and work you way up to higher learning. The Magic School Bus – Science – we signed up to get a packet once a month and kids love it. writing journal – Writing journal are great for kids to get their thoughts on paper. We do creative writing and right now I don’t even check my kids work, I just want them to write and enjoy it! Lego technic toys – Lego are great for boys and girls, my kids love legos. We go through stages where they play with them for weeks then don’t touch them for months. They teach math skills, creativity, architecture and heck they are just fun. iPad apps – There are so many educational iPad apps it will blow your mind. I have mostly educational apps on their iPads because they may be playing all day on the device but at least they are learning something. Here are some more posts I have written to help you find out more about unschooling…. Radio free school/Natural Born Learners – Tantrum space for people who eschew factory learning in favour of ‘open source learning.’ Open season on all things we might bump up against. This blog was started by un-schoolers at radio free school, a weekly radio show by, for, and about, home based learners. Radical Unschooling – Sandra Todd website who thinks and writes and speaks about unschooling. Sir Ken Robinson – He was on Ted talks about how the school system has failed us.